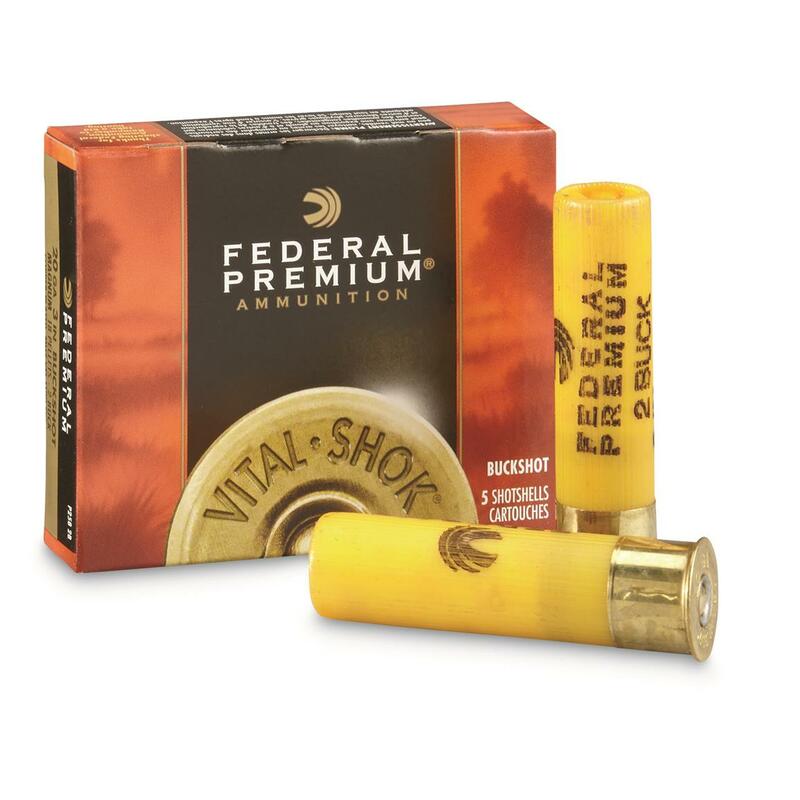 Federal® Premium Buckshot. Dense pattern and staggering blows. This is the guaranteed way to knock 'em down! Federal's patented spiral stacking process with plastic shot cup and buffering ensures dense patterns and hard-hitting blows that knock game down fast. Premium knock-down power in every shot! Order Today! Federal Premium, 20 Gauge, 3 18 Pellets 2 Buck Buckshot, 5 Rounds is rated 5.0 out of 5 by 7. Rated 5 out of 5 by DJBoone from Federal 20 gauge buckshot The buckshot came very fast and the price was reasonable. Rated 5 out of 5 by Avid shooter from Great price, excellent pattern. I wanted shells with a larger pellet. These fit the bill perfectly. They are plated, thereby hold a better pattern than lead and give a larger pellet for Deer, or Coyote. I will buy more, when on sale. Rated 5 out of 5 by subman from Perfect all-purpose buckshot These rounds work equally well for deer, varmints or home defense.The 'spiral stacking' and buffering give a tighter pattern at short to medium distances, resulting in a cleaner kill. Rated 5 out of 5 by Merl from I got lucky and bought this on sale. I fired 5 rounds of this and it seems as if it's almost twice as powerful than 2.75 inch #3 rounds. It patterns well at 10 yards. Rated 5 out of 5 by SGWilliams from Great Customer Service As always, very fast shipping and price is hard to match. It is difficult to find #2 for 20 gauge these days and Sportsman's Guide is the go to source for hard to find ammo for me. From .444 Hornady superformance, to 7mm-08 to 20 gauge buckshot. My son shot his first buck with these at a little over 30 yards. Rated 5 out of 5 by Run22 from Great shells! AMAZING shells! I bought a case of them and they work great and have an amazing impact!